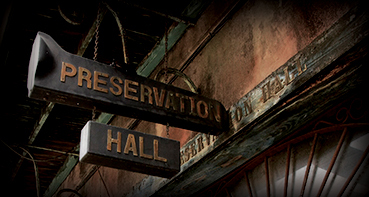 Presenting at 5 and 6 PM, The Preservation Brass Band with Mark Braud. Born in 1973 into the musical Brunious and Santiago families, Mark Braud has always wanted to be an entertainer. At age twelve, his uncle Wendell Brunious gave Braud a cornet, and soon after that he began playing jazz with Nicholas Payton. He recalls, “I had always listened to my uncles and my grandfather [composer/trumpeter John ‘Picket’ Brunious Sr.]. . . . But when I started meeting younger guys who were into music, it was an inspiration for me to play jazz and get more into listening to records.” Braud started his career with the Olympia Kids, an offshoot of the Olympia Brass Band for younger musicians, and soon began gigging, recording, and touring with New Orleans legends, including the Original Tuxedo Jazz Band, Eddie Bo, Henry Butler, Harry Connick Jr., and Dr. Michael White.